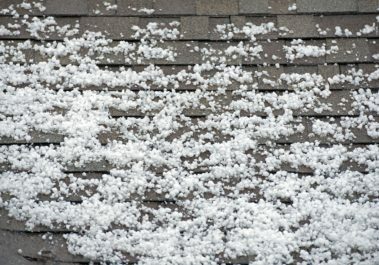 If hail damage has compromised the roof on your home in the Maryville, Illinois area, let Daech & Bauer Roofing help you return your roof to optimal condition. Hail, high winds and heavy rains can weaken the level of protection your roof provides for your home, opening the door for leaks, mold growth and rapid roof deterioration. If your roof has been damaged in a storm, Daech & Bauer can assist you throughout the insurance claim process to make sure you receive the compensation you deserve. In addition to hail damage repairs, Daech & Bauer also offers roof replacements for those situations when repairs won’t be enough. We install a total roofing system that is designed to prevent water intrusion, create a roof that is durable enough to withstand high winds and heavy rain, and allow for sufficient attic ventilation. This comprehensive system can slow roof deterioration while also helping manage attic temperatures, which can potentially reduce your energy usage. If you would like to learn more about the hail damage repairs and other services we offer for homeowners in Maryville, IL and throughout the region, contact Daech & Bauer Roofing today.